Have you ever seen anything like this before? I have seen many rusted base frames but this one is the worst. 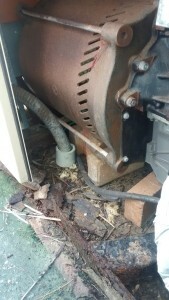 Can you believe that this generator is in this condition after only 7 short years! 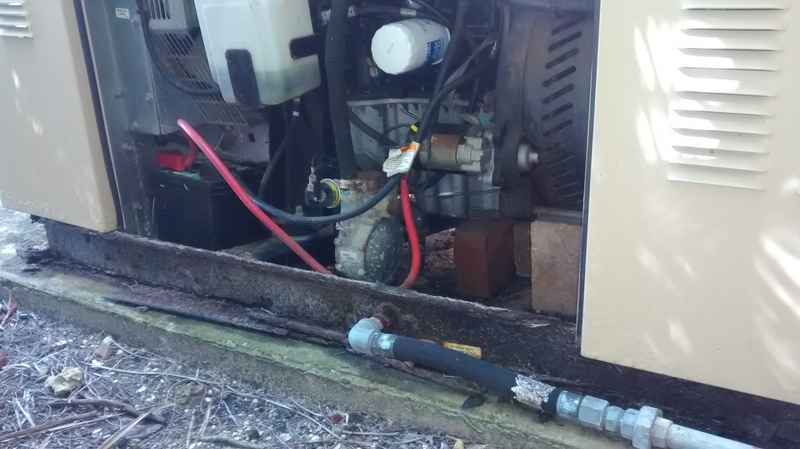 Personally, I would not want to shell out thousands of dollars for a generator and end up with this in 7 years. I would spend a little more money and get a brand that will last. What is the brand that will last, you ask? I will get to that shortly. Look closely at the picture and you will notice that the alternator and engine are resting on bricks! Crazy! This customer will have to spend thousands to get this unit back to a safe, running condition. So, what is the best brand that will last in this environment? Kohler! Kohler Generators has the best units on the market. Their base frames are thick, high grade of steel and coated to prevent rust. You might pay a little more but you will have something that lasts.